Italian car major Fiat on Wednesday launched its much-awaited premium small car Grande Punto in both petrol and diesel variants in the Indian market, priced between Rs 3.99 lakh (Rs 399,000) and Rs 6.11 lakh (Rs 611,000), ex-showroom, Delhi. The company believes that the small-car segment is under-tapped and customers are increasingly looking forward to international brands on Indian roads, he added. 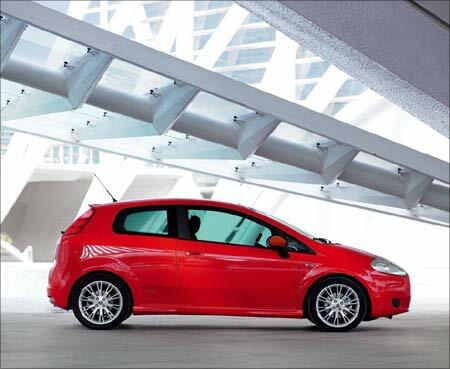 Grande Punto, which was first launched in the European market in 2005, would be rolled out from the company's plant at Ranjangaon in Maharashtra in four variants each in both petrol (1.2 litre an 1.4 litre) and diesel modes (1.3 litre). The petrol variants would cost Rs 3.99-5.61 lakh (Rs 399,000-561,000), while the diesel cars would be offered at Rs 4.85-6.11 lakh (Rs 485,000-611,000). FIAL, a 50:50 joint venture between Italy-based Fiat SpA and domestic auto major Tata Motors [Get Quote], plans to position the car in the premium hatchback segment along with Maruti Suzuki's Ritz, Hyundai's i20, Skoda's Fabia and Honda Siel's Jazz. The company said Grande Punto would be retailed through over 100 Tata-Fiat dealers network across the country. The company's Ranjangaon facility has a production capacity of 200,000 cars and 300,000 engines per annum. It produces Palio Stile and Linea from the plant. Fiat India is gearing up for the array of new car launches in India and will convert its entire 65-dealer network in India on the lines of its global novelty stores. All its major stores will bear Fiat’s signature ‘red and white’ layout and landscape. The first signature store has already started operating in Bangalore from April while two more signature stores will come up at Delhi and Faridabad shortly. The company will also introduce Fiat merchandise items in these stores. The Fiat Linea sedan in the range of Rs 8-10 lakhs will debut around October and Fiat Grande Punto will hit the market early next year. These will roll out from its Ranjangaon manufacturing facility in Maharashtra, which is operated jointly with Tata Motors.